Whew, what a hot summer day! Will be off to the bank in an hour, just waiting for the sun to come down a little bit. Before leaving, let me write a review of Ziaja Goat's Milk Hand Cream. I bought this product at Beauty Bar in Podium and I have been using it for a month now. Ziaja Goat's Milk Hand Cream 80 ml is P200 or around 5$. It is for dry and wrinkle prone skin. Provides intense hydration and makes the skin more supple. Works to revitalize the epidermis and softens rough skin. Helps to strengthen the nails, working to prevent their splitting and breaking. 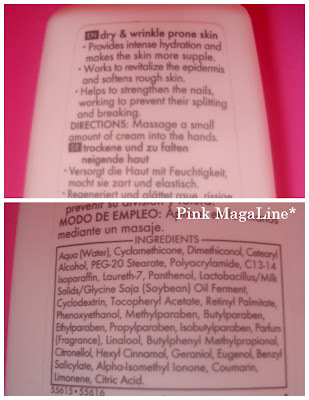 Some of the ingredients include Salicylate, Citric Acid, Lactubacillus or Milk Solids, etc. Please refer to the photo above for the complete list. The white cream smells fine and not too strong. Apply a small amount to your skin. Spread evenly. I recommend it using twice a day. In my case, I use it every time I feel that my hands are dry. I actually have 2 brands of hand cream these days, but I prefer this one 'cause it works better. 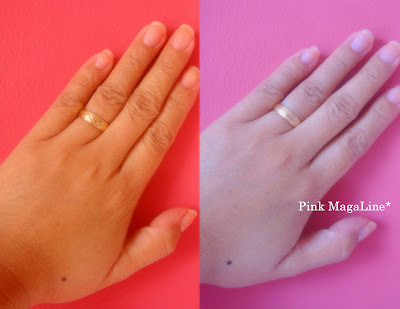 Photo comparison or before and after use of Ziaja Goat's Milk Hand Cream. The left photo displays noticeable dryness while picture on the right is the hydrated version. I will use this products for the meantime since my all time favorite hand lotion Nivea Age Defying Q10 Plus is no longer available in the local market. Price is affordable. Easy to carry. Most of all, I can find it in the nearest mall. I'm not a fan of using hand lotion cos I don't like that sticky feeling esp. I'll be using it to touch other things. Am I weird? Cos I have been hearing so many advice on its importance. Wow! I must try it. It really feels stingy when my hands are dry. That sounds like a promising product. But I just use my regular lotion for my hands. Currently it's Moringa-O2 Herbal Moisturizing Lotion (whew, what a mouthful! ).